Bound for adventure upon the pirate vessel they've taken as their own, the heroes face a sea of dangers as they chart a course to become true Free Captains of the Shackles. But life as a pirate doesn't prove any easier now that they're in command, as deadly sea monsters, the corpses of drowned scallywags, and raiders from the deep rise to oppose them. When a most unusual map falls into the adventurers' hands, they have the chance to change their fate in a single daring raid. Is it the heroes' destiny to be the next victims of the merciless waves, or will fortune smile upon them and spur their rise as the newest and most infamous pirates of the Shackles? 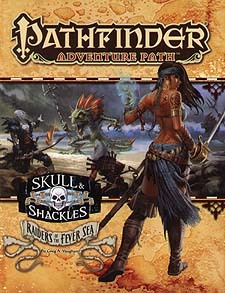 Raiders of the Fever Sea, a Pathfinder RPG adventure for 4th-level characters, by Greg A Vaughan. A gazetteer of Golarion's many oceans and seas, and an exploration of the various aquatic races that inhabit them, by Adam Daigle, with Patrick Renie, F Wesley Schneider, and James L Sutter. A journey to Butcher's Rock and deadly cyclopean prophecies in the Pathfinder's Journal, by Robin D Laws. Six new monsters, by Jesse Benner, Mark Morland, Steven D Russell, and Greg A Vaughan.